When you need more home screen pages place your apps, app folders, and widgets, this guide will show you how to do this. When you get your Moto G (including Moto G 2nd Gen), Moto E (including Moto E 2nd Gen) and Moto X (including Moto X 2nd Gen), there are at least 2 home screen pages. The leftmost page is reserved for Google Now. So, if you want to add more apps to the home screen, or add some widgets to the home screen, you will need more home screen pages. Of course, you can use app folders to manage apps in home screen. This guide will show you how to add new home screen pages on Moto G, Moto E and Moto X, and how to delete home screen pages on these devices. In the guide, Moto G is used to simplify the text. This guide actually applies to all Moto devices, including Moto G, Moto G 2nd Gen (Moto G 2014), Moto E, Moto E 2nd Gen (Moto E 2015), Moto X and Moto X 2nd Gen (Moto X 2014). As Nexus devices (e.g., Nexus 5 and Nexus 6) use the almost identical Google Now launcher, you can also follow this guide if you are a Nexus user. To add new home screen pages on Moto G, Moto E and Moto X, please follow these steps. You can enter Moto G home screen by tapping the on-screen home button (see Moto G layout). Of course, if you keep tapping Back button, you will also be directed to the “home” of home screen pages. 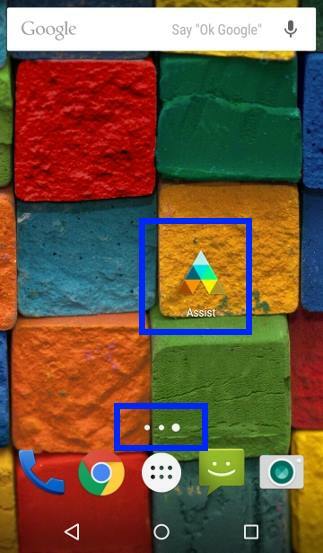 Once in Moto G home screen, tap and hold (i.e., without releasing your fingers from the screen) an app icon. 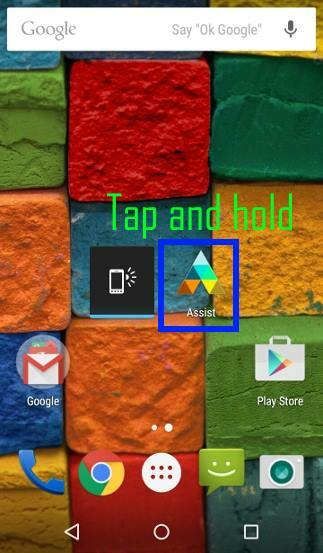 For example, in this guide, we tap and hold the Motorola Assist icon a shown below. 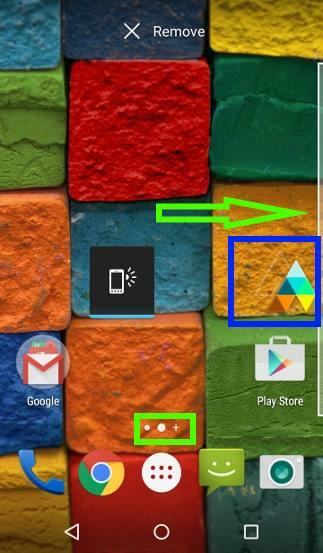 Without releasing your finger from the screen, move the app icon rightwards as shown above. Once the icon is approaching the edge of the screen, you will see a white line near the edge as shown above. This white line is an indicator of next home screen page. If you are already in the rightmost page of Moto G home screen, this white line tells you that you can add new home screen pages on Moto G now. 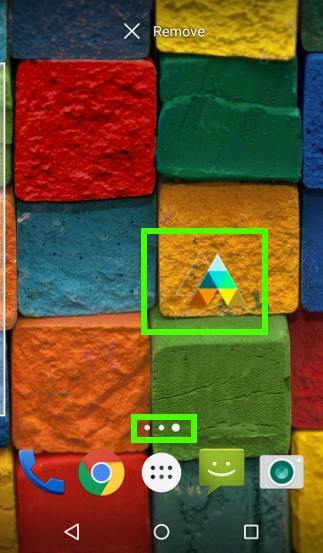 At the same time, the home screen page indicator shown in the green box will have a + sign ( as shown above). Move the app icon cross the white line to reach the new home screen page as shown below. Release your finger from the screen as shown above . The Assist icon is now in the new home screen page. This is the normal procedure to add new home screen pages on Moto G, Moto E and Moto X. Another way to add new home screen pages on Moto G, Moto E and Moto X is by adding apps or widgets to home screen. As you have learnt in this guide, you can add apps to Moto G home screen for quick access. When you drop the app or widget to Moto G home screen, you have the option to add a new home screen page similarly. In the new Google Now launcher, the maximum number of home screen pages was lifted from 7. But if you have too many home screen pages, it will defeat the purpose of home screen: you are probably using the phone less efficiently. You probably should remove some seldom-used widgets from the home screen, and use App folders to organize apps. In Moto G, Moto E and Moto X, you cannot directly remove a home screen page. A home screen page will be removed automatically when it is empty (no app icons, no widgets on it). In other words, Google Now launcher does not allow empty home screen pages. Such pages will be removed automatically. Can you add new home screen pages on Moto G, Moto E and Moto X? If you have problems or questions on how to add new home screen pages on Moto G, Moto E and Moto X, please let us know them in the comment box below. I have 2 home screen pages but somehow third page is showing as google app. On press and hold only two pages show up. The Google Now page in the leftmost is part of the Google Now launcher. You cannot modify or remove it. If you really hate it (actually it is very useful if you get used to it), you have to try third-party launchers. Google Now launcher is a very light launcher and will not drag down your Moto G4. My Moto g4 has a pdf reader installed, but it doesn’t show up on the apps screen or anywhere else for that matter. How can I put a shortcut to it on my homescreen if I can’t locate it? Opening a pdf is a right palaver, requiring navigating through settings, storage, etc, a right pita. You are probably talking about Google drive which has a built-in PDF reader. But you cannot use it as a standalone app. You can install any PDF reader apps and add it to home screen. Thanks. Installing a separate app was what I was trying to avoid, but it looks like I will have to for convenience’s sake. The PDF reader can only be launched when you ry to open a PDF file from other apps. Anyway, you should install a standalone app for PDF. There are many. What new page are you referring to? if you refer to the leftmost Google Now page, it is part of Google Now launcher and you cannot remove it, unless you use third-party launchers. Hi I just updated on Dec. 05, 15. My contacts is now showing as home page after unlock. How do I change this..as I keep accidentally dialing contacts. I have tried adding new HS thinking I could bypass this but I have the max number of screens I guess. When you unlock the screen, swipe upwards, not rightwards.